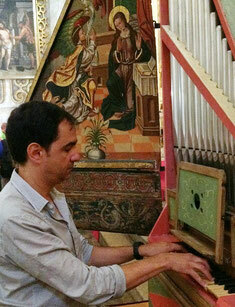 Former Organ teacher at the high music school “Farnesina” in Rome, organist of the Civitavecchia-Tarquinia's episcopate, since 2006 he is the founder and artistic director of “Organa Nostra”, the Early Organs Festival in the province of Viterbo. He teaches in Tarquinia, at the school "Officina dell'Arte Sebastian Matta", where also gives Summer Masterclasses since 2013 and monthly workshops since 2017. 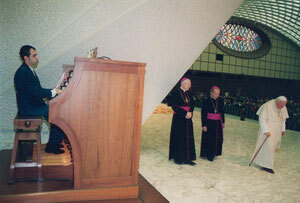 He was organist at the Vatican State, during the General Audiences given by pope John Paul II (1999-2002) and at the S. Ignazio from Loyola's church in Rome (1992-2004). 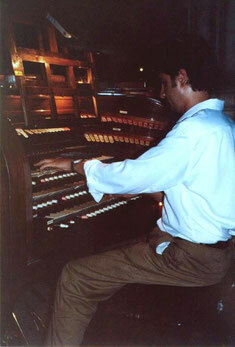 Graduated in Organ and Organistic Composition by "Santa Cecilia" Conservatory of Music in Rome (1994), under the direction of Mr. Luigi Celeghin, he also studied early music with Christopher Stembridge (Chigiana Academy in Siena and Arezzo) and Luigi Ferdinando Tagliavini (Italian Organ Academy, Bologna). 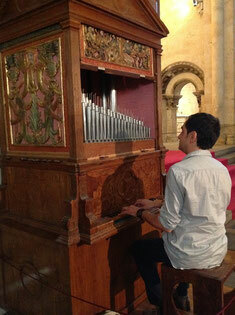 In 1995 he won the second prize at the National Organ Competition “Città di Viterbo”. He took part in many music festivals like “Arte organica” (Spain), “Festival di Pasqua” (Rome), “Festa della Musica” ("La Sapienza" University of Rome), “Le ore dell’organo” (Rome), “Festival del XVIII secolo” (Lecce), “Concerti d’Autunno” e “Concerti di Primavera” (Polesine), “Settembre organistico” (Fabriano), “Suoni dal passato” (Macerata), ”Accademia Organistica Elpidiense” (S. Elpidio a mare), Circolo Culturale Sirolese (Sirolo). 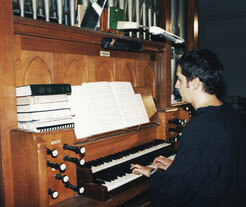 In 2003 he played for the Spanish Culture Institute "Cervates" in Cairo (All Saints' Cathedral, Egipt) and in 2005 inaugurated the new Casavant organ in the St. Charles Borromeo's church in Toronto (Canada). 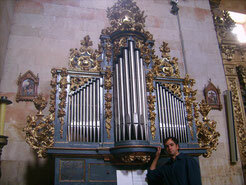 Every year, since 2014, he gives the traditional New Year's Organ Concert in Salamanca (Spain), at the San Juan de Sahagún's church. He played, among others, with the London Symphony Choir (“A Deutsch Requiem” by Brahms, at the Ara Coeli's church in Rome), the Radio Sophia's National Orchestra (Bach's Mass in b min. conducted by Milan Natchev, at the church of S. Maria degli Angeli, Roma) and the "Orchestra Sinfonica di Roma" (Tosca, with Daniela Dessì and Fabio Armiliato, at the "Auditorium della Conciliazione", Rome). Concertist, soloist and continuist, especialized in early music, he played with various groups like the Israel Philharmonic Orchestra, conducted by Zubin Mehta, the Orchestra Sinfonica di Roma, International Chamber Orchestra, Orchestra della Fondazione Scarlatti, Opera Ensemble from Teatro dell’Opera di Roma, etc. Graduated in Harpsichord in 1997, with top marks and honors, by “S. Cecilia”'s Conservatory of Music in Rome, under the direction of Paola Bernardi, he focused on early music studying with C. Stembridge, J. B. Christensen and L. F. Tagliavini. He played in the Parco della Musica Auditorium, Teatro Argentina, Oratorio del Gonfalone (Rome), Teatro Dal Verme (Milan) with Umberto Eco, Sala Greppi (Bergamo), Ravello Festival with Z. Mehta, Festival Barocco in Palazzo dei Papi and della Tuscia University in Viterbo, in Salzburg (Austria), Palma de Mallorca (Spain) and in almost all the italian regions. He colaborated with singers like Mariella Devia, Gloria Banditelli, Gabriella Martellacci, and he has always been well reviewed, also by the music magazine Amadeus. He taught harpsichord in the A. Arias Maceín Conservatory of Music in Madrid, Spain, and at the moment he gives masterclasses in Tarquinia (Italy). He wrote an article about the harpsichord maker Girolamo Zenti (1600), published by the Galpin Society Journal of Cambridge (LX).